When my neighbor Tony gifted me with some very fresh venison steaks recently I was excited and a bit apprehensive. Where we live the deer are plentiful and I have long viewed them as pests. Prior to the installation of a high fence for my back yard, our garden was the scene of daily deer traffic. They ate my flowers, nibbled on my shrubs and left plenty of droppings near where my children played. So the idea of “thinning the herd” has never been offensive to me. The problem is I have never cooked venison before. What do I do with this?! I got plenty of advice from folks who have experience with venison. I was tempted to marinate the steaks or use a brine. But I ultimately decided to go the simple route and just pan sear the venison steaks. The exotic flavors come primarily from the cauliflower couscous side dish and the accompaniment of the sweet and tangy red onion compote. 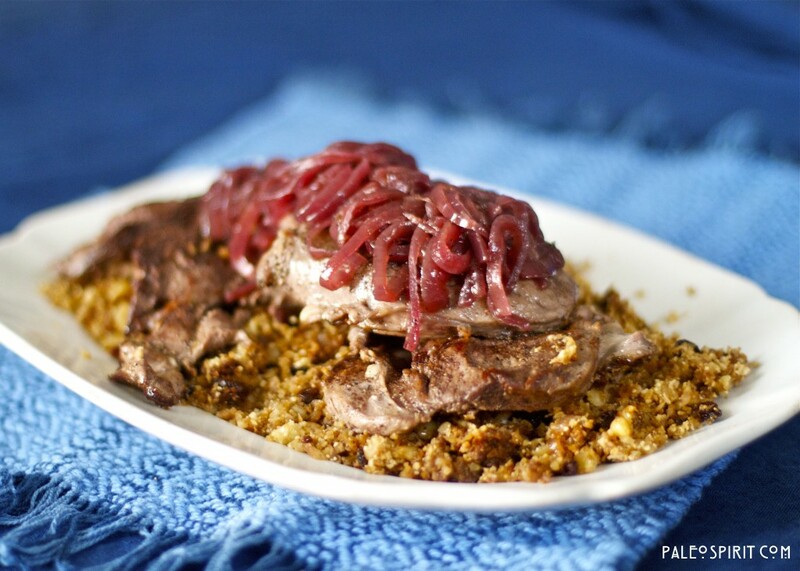 These recipes are the result of my plan to treat the inherently paleo venison (hunter food!) with the respect it deserves. I wanted to add some sophistication to this meat and create something special with complimentary flavors. While taking photos of the venison and cauliflower couscous I offered some to Nathaniel who eagerly submitted to being my taste-tester. 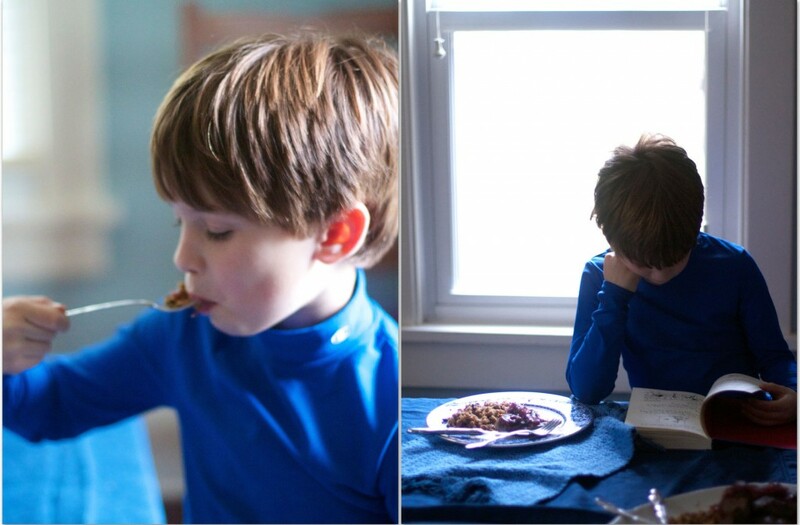 But my voracious reader did a little multi-tasking during his taste-testing gig. Oh how I love a reading boy! Heat a cast iron skillet on medium heat. 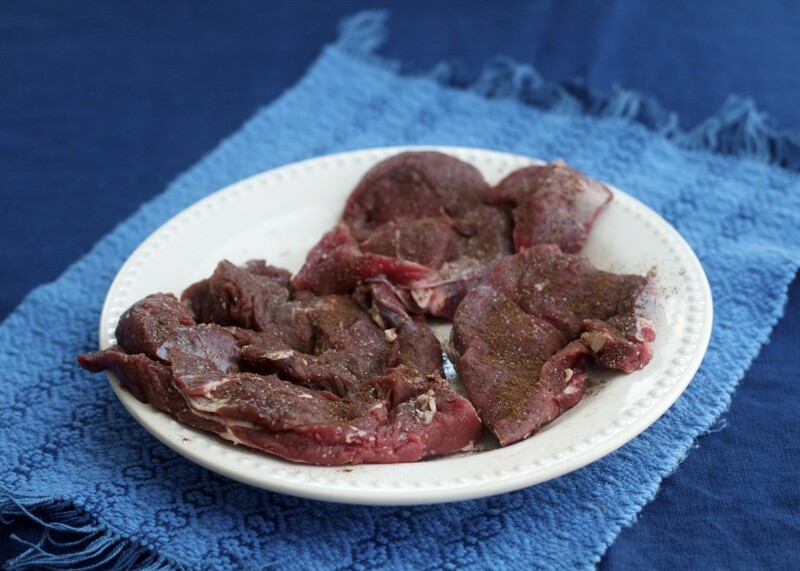 Sprinkle both sides of the venison steaks with the salt, pepper and allspice. 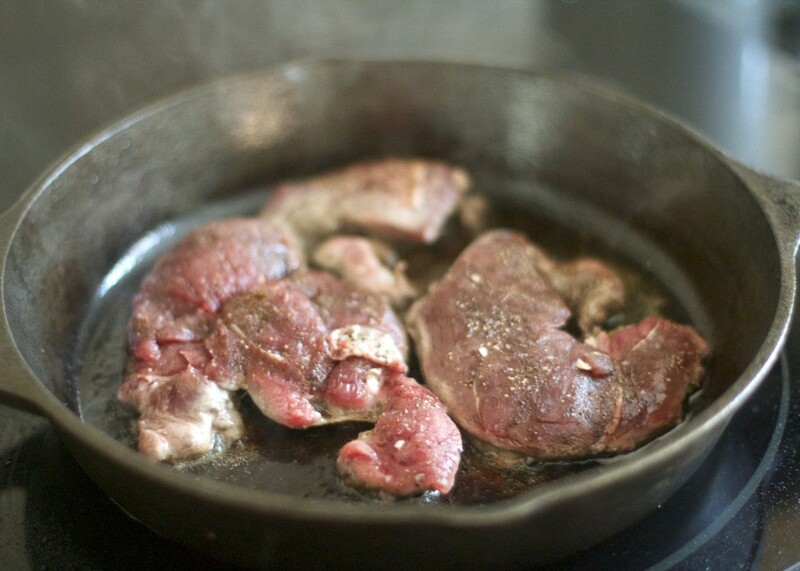 Melt the fat in the skillet and grill the venison steaks for about 3 minutes per side. Cut the cauliflower into florets and place in a food processor (in batches if necessary) and pulse until it resembles couscous. Place the shallots, pine nuts and dried currents in the hot skillet where you cooked the venison. 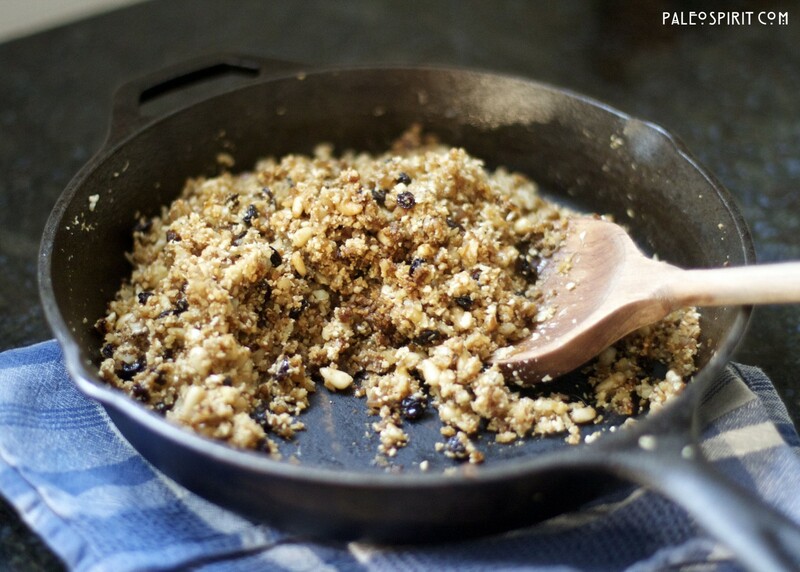 (Or, if making it independent of the meat dish, heat 2 tablespoons of oil in a pan.) Cook for about 2 minutes stirring constantly and deglazing the pan. Add the cauliflower couscous, salt, allspice and pepper to the pan and continue cooking and stirring for about one minute. Turn the heat off and allow the cauliflower couscous to continue cooking for another 1 to 2 minutes. 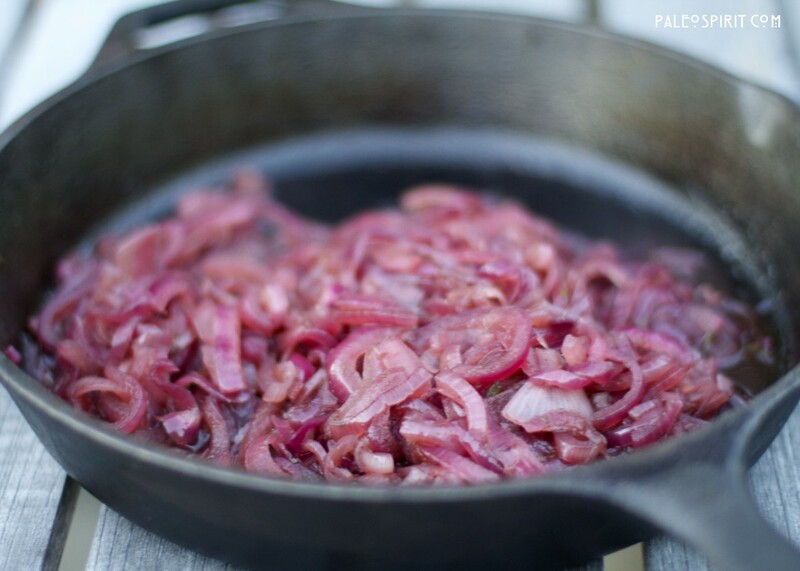 Combine the sliced onions, oil, wine, vinegar, water, honey and rosemary in a medium pan and simmer, uncovered, for approximately 30 minutes, stirring periodically. 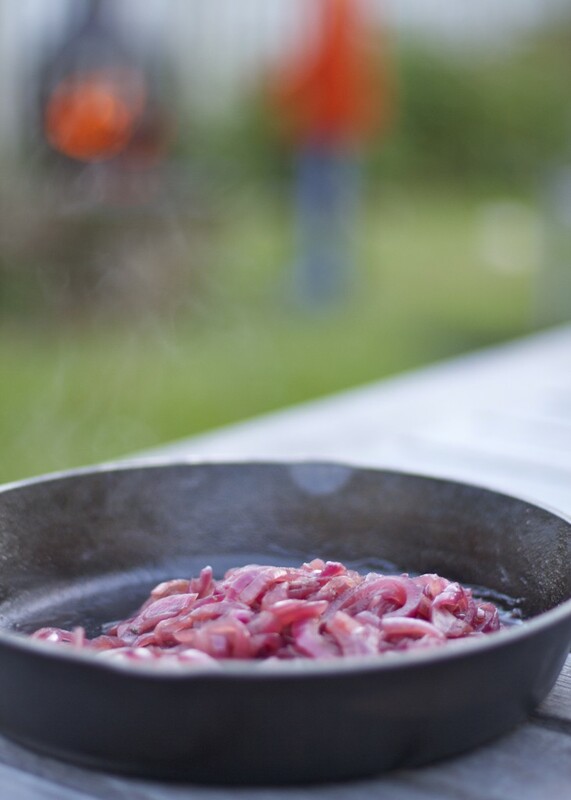 Once the onions are softened and most of the liquid absorbed add a sprinkle of salt and pepper, stir and serve. Thanks for stopping by. I’d love to hear other ideas for preparing venison. Find us on Facebook and Pinterest. 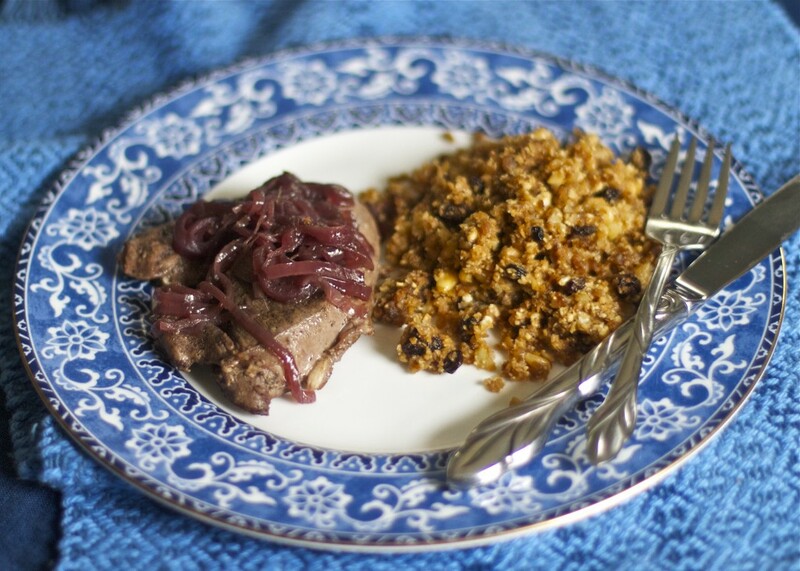 2 Responses to "Venison Steak with Cauliflower Couscous and Red Onion Compote (Paleo)"
Recently I marinated venison loin steaks and cooked them in the Crock-Pot with LOTS of onions. The result was a kind of French-onion-y stew that tasted amazing. 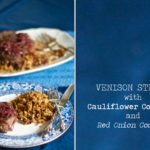 (I have to admit that the marinade was one I had on hand and it wasn’t exactly Paleo-friendly, but I’m sure any Paleo-friendly marinade with lots of good seasonings like garlic and pepper might give similar results.) I also did a venison roast a few weeks back in the Crock-Pot with the Coffee Spice Rub from Everyday Paleo. The flavor was great, but the coffee grounds were kind of icky, so I don’t know that I’d make it again. My husband is a hunter and has brought home both deer and elk. I find that the best way to prepare this free range meat is to age it. We put it on a rack and age it 2 weeks in the refrigerator. This removes all of the “gamey” taste and really tenderizes the meat. Then it doesn’t matter how it’s prepared because it’s just plain delicious. I season it with salt, pepper and fresh lime or lemon rind, grated. We usually grill it (charcoal). 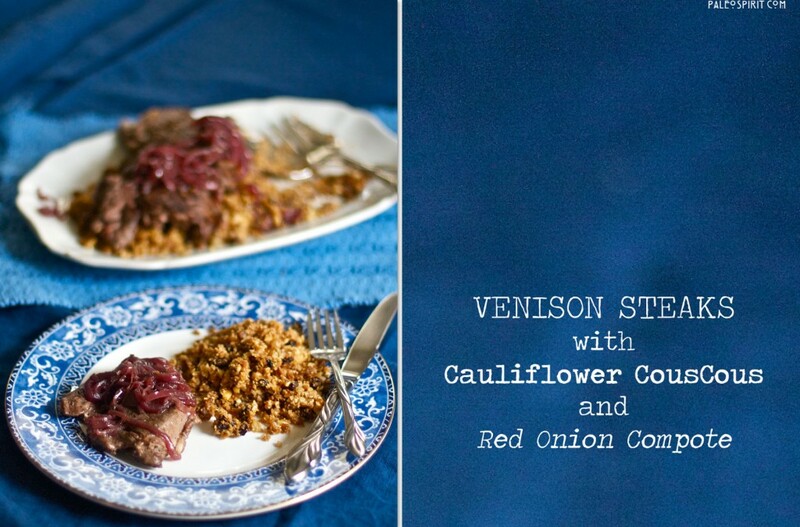 I have not served it with any accompaniment, but your red onion compote sounds fantastic! My husband is heading out into the field in two weeks to bring home some more deer. I’m going to try this recipe (after aging it of course).